12.5 Saturday. Valdesalor to Casar de Caceres. The rest in the afternoon was better than the sleep at night, although we are grateful to the village of Valdesalor for the free lodging in the football ground. But we are up and walking by 0630 and cover quite a lot of ground mostly on the Via Pecuaria until we reach Caceres at about 0900. More hoopoes, storks, and kites, on the way and as we enter Caceres a Ermita with at least 14 storks in various nests. In Caceres we bid farewell to Joe, he has a geass, his friend, a catholic priest from Gibralter, is joining there him for a fortnight to walk the Camino, he is according to Joe unfit and significantly overweight. Joe is determined to improve both these but is worried that he may break him on one of the toughest stretches of the Via de la Plata that lies ahead of us all. We have promised to keep in touch and may yet meet again strange things happen On Camino, some of them involve buses! 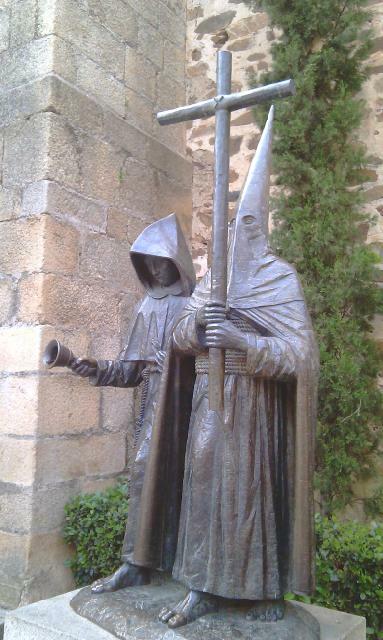 We spot some strange statuary as we bid farewell Joe a font of knowledge explains the Klan member is a hooded penitent whose sin is bad enough or he is important enough for anonymity to be allowed in his penitence. We move swiftly out of Caceres, another roman town with, we are told some interesting points but after the heat yesterday we are in no mood for extra romin'. A few km of asphalt is our penance but about halfway to Casar de C we are released on to the old dirt track at the side and make all haste to get there and out of the sun which has appeared from behind thin clouds and is fast becoming a ball of fierey torment. Today is not too bad and we gain shelter in Casar in the bar opposite the free municipal alburgue, which also does a good 9euro menu de dia. 24km 5hrs It does get tougher than this! 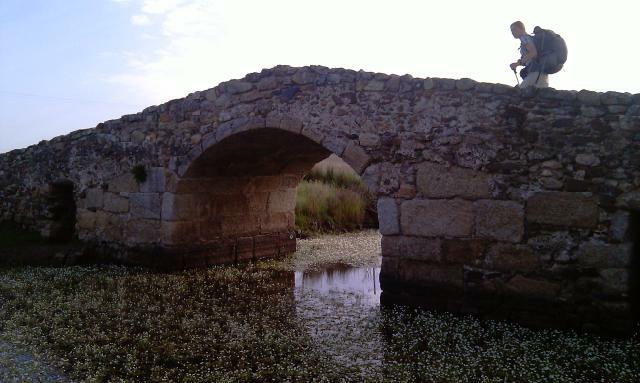 Roman bridges, storking storks, playing Hoopoo la, A bridge too far. 11.5 Friday. Alcuesar to Valdesalor. The wander round town yesterday found us a new apparently complete but totally unopenned alburgue. This secular albergue is well off the beaten track and although it has superb views from town it will possibly not see use unless the route changes. The monastry in which we stayed provided a very good evening meal after the blessing service conducted by the elderly catholic priest and his unsual altar boy. Donativo supports the home for those falling past the state arrangements. We manage to get released from this secure housing by 0700, half a hour before advertised (a rope would be required to break out earlier), and started down the camino as dawn was breaking. Possibly we were the first down this track that day which might explain the abundance of hoopoes (ten seen in about a km) although they remained common all day especially one videoed by Tony, demonstrating that they peck (a telegraph pole in this case) like a woodpecker and the characteristic poo poo occuring when peak makes contact with pole. Also along the way two ?bee eaters numerous raptors and many storks both feeding in fields and in their charactetistic pose on tops of churchs. The route rejoins the Via Pecuaria, one of the larger drove routes after Casas de don Antonio having passed over the first of three roman bridges. There are multiple small archeological digs along the way as well as actual or replacement millarios (roman milestones). We arrive at length in Valdesalor very hot and sweaty, having staggered acroos the last bridge, even Betsy claims to be a horse, women normally glow! But after a beer in the nearest bar and we follow a spanish pilgrim who has just claimed the key to the albergue, it is free! It is the changing rooms of the local football pitch. There are hot showers (not really needed) cold is preferable just at present and a floor with gym mats to sleep on, Joe walks in 20mins later and we have a good lunch at the bar/elderly day centre we had the much needed beer at earlier. After that there is not much to do but sleep off the heat. In the Footsteps of the Wolf. 10.5 Thursday. Aljucen to Alcuescar. We leave the little village of Aljucen at 0700 sharp it should be a hot day again, we lucked out in this small albergue as an early arriving group of three we had the three bedded room to ourselves. We tumble down the hill to the cafe and start the day right with coffee all round. A smart downhill trot and over the bridge on the Rio Aljucen and we are on to a series of verdanas, the green drove roads of the spanish countryside. These are a delight with flowers in the early morning sun and we trend slowly upwards through granite boulders and oak trees in beautifully managed wooded pasture, this is the Park Natural de Cornalvo. 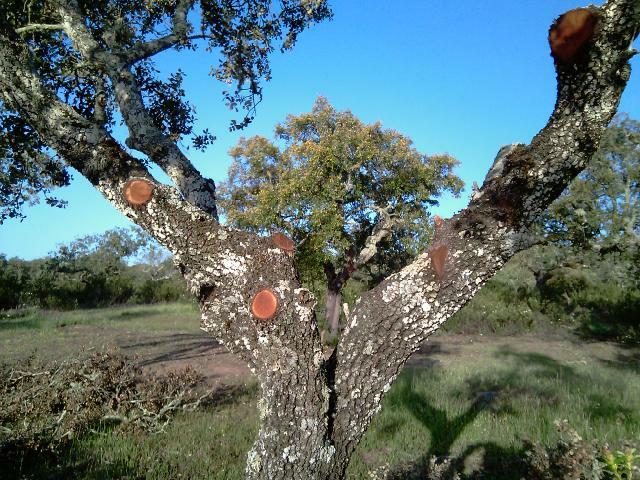 There are occasional olive groves and some cork trees but mostly this is pasture for foraging animals, and takes some serious forestry to maintain it in its open shaded but with swathes of grassland state, like a Capability Brown landscape at times. We see the foresters, and the results of their labours all around, a very harmonious landscape. All too soon we reach the cross where reputedly a sheperd boy was eaten by a wolf in a year we cannot ascertain, on his way to a fiesta. This is only 5km from our lodging tonight in an old monastry now in part a home for elderly survivors of a down and out lifestyle, this home recieves no government support and exists on donations from pilgrims and others. We have a good lunch again with Joe who catches us up after his breakfast in the cafe and then are locked in to the monastry for siesta. Of mention are the excellent drying facilities, washing lines under cover plenty of space bring your own pegs! There is a service tonight at 7pm, some of us may attend. The Age of the Aquarius. 9.5 Merida to Aljucen 16km. Eventually we agree a short day, Tony's planning spreadsheet normally excellent is adrift 8km, it is too far to Acuescar on the hot day forecast. So just as it is light we have a pastry and orange juice in our room and set off through the streets of Merida looking for yellow arrows and coffee, the former are easily found just before the aqueduct of Milagros the latter not available, the closest being a nightclub still cleaning after a late night. 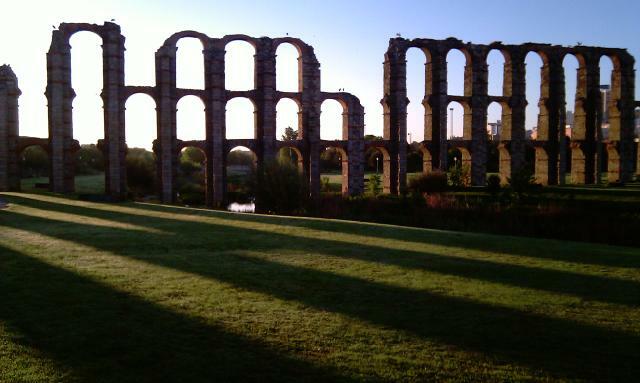 The Milagros Aqueduct looks most impressive in the early morning light storks are already noisily clacking their beaks at each other. Betsy takes yet more photos, she may yet be done for storking. After about 7km of road we reach the Prospina reservoir, a marvel of Roman engineering by Aquarii whose responsibility it was to ensure the water supply to the city. The pictures we have seen show the inside wallof the dam during cleaning a few years ago and the regularly spaced support towers along its length. We wondered why these were needed and were informed by one of the many explanatory notices along the dam wall that a similar aqueduct supplying Toledo had collapsed while empty due to the weight of earth needed against the downstream side. The citizens of Merida and their Aquarius obviously learnt from this misfortune. The rest of the walk slipped uneventfully between oak trees and flowers though we are happy to reach Aljucen as the day is already heating up by 11.15. A day just roman around. We had never heard of Merida before planning for this route but learning it was the best preserved roman town outside Italy we planned on a rest day. The ticket we bought yesterday comes with a free guide and entrance to a variety of roman sites as well as the moorish Alcazar. Prime of these were the Theatre (where Pedro the hospitalero in Torremejia is an actor during the summer season (when few are stupid enough to walk the Via de la Plata)) a fantastically well restored roman theatre with adjacent amphitheatre. The Museum of Roman art housing all the bits of stone from various sites around town (all those not valuable enough to be nicked by Madrid) plus a lot more in a very well presented modern gallery. And a galaxy of lesser sites some still being excavated and preserved. The city has World Heritage Site status and hopefully this will keep it and help it develope further as a site of Roman Empire. 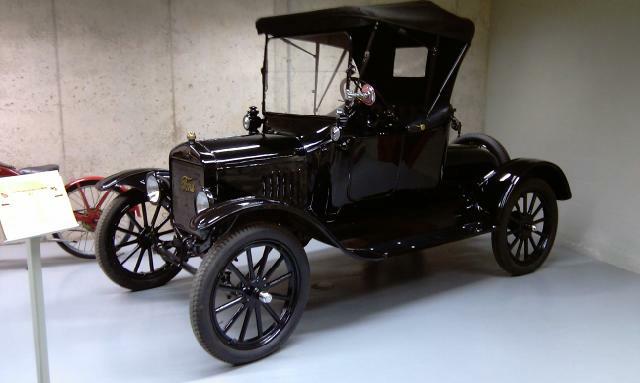 It is an amazing place where the modern rubs against the ancient (aparently without blisters). Talking of which Betsy has bought new socks her Rohans developed holes. If you see a large lump of stone on its side, round here, chances are its a roman something. After lunch in the appropriately named Via Flavia where we also had breakfast, just up from the Alczar, we go over the hill on our route out of own tomorrow to visit the Milagros Viaduct. This great construction supplied the town with water in Roman times from the Prospina reservoir which we should pass by tomorrow 7km out of town. It is now a high rise for stork families. We are only 16km from Merida in Torremejia so when we start at 7.30 a leisurely day is expected, the sun rises and barely shines through high cloud, rain threatens and withdraws, a perfect day for walking. The route is much better free of the land of mud, though a 24hrs without rain helps. We see a flock (well more than a dozen) storks in a field they fly as we approach, harrier and a couple of black kites are also looking for breakfast. 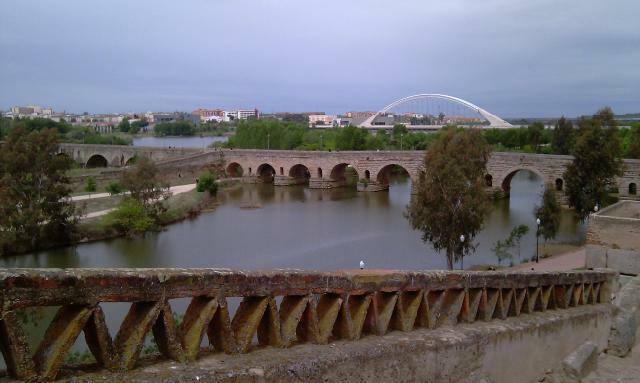 Passing a triangulation point of the spanish IGN whose maps Tony dowloaded free and which we use from our phones every day, we see Merida and descendto the river where the roman bridge of 40 plus arches spans the Rio Guadiana which then flows to Badejoz and on into Portugal. It is now a foot bridge having a rest after 2000 yrs of use and repair by Visgoths, Moors, Christians and modern spain and one of the best entrys to any town on Caminos. On the right after crossing is the Alcazar (fortress constructed by the Moorish government in Cordoba in 800ish afyer putting down a rebellion). We have a beer, find lodgings and visit it. It has the lot, from roman streets, a Moorish water cistern (filled by filtering through rock and soil from the river 30m away now with goldfish), to more recent additions from 16C and the current Extramadura Ajuntamiento (offices). All of these use bits of previous buildings in their construction (except the BC dated bit of Roman street!) together with ashlars (word of the day) lying arround in bits of gardens, resulting in a delightful historical hodgepodge of a place with great views of the bridge. After some lunch we retreat via the temple of Diana (even more historical mixture) and the Trajan Arch (agreed to be roman bit not much else, apart from huge), to our room in the Hostal Senero to clean up and siesta. Villanova de los Banos to Torremejia. The day dawns an orange ball of fire is seen in the east, it is Not Raining! We leave town about 7 after breakfast in the Albergue Touristico, very soon we hit the dirt track it is well made of fine gravel and we race along in fine spirits, after a while the Camino yellow arrows indicate a camino de tierra to the left through the olive and vinyards, one of our guides warns against it after rain, we think the last few days count and continue along the good gravel track. This adds maybe 2km to our route but avoids a very muddy and tiring route. There are vinyards all around, new plantings are common and the whole area is well tended. We see a male Hen Harrier magnificent in his pale grey plumage quartering across the land of mud (yes it really is called Tierra de los Barros) on the lookout for food. After a long while we pass Alemendralejo off to our left but the sea of vines does not change. There are square kms of it. Gigagallons of wine. 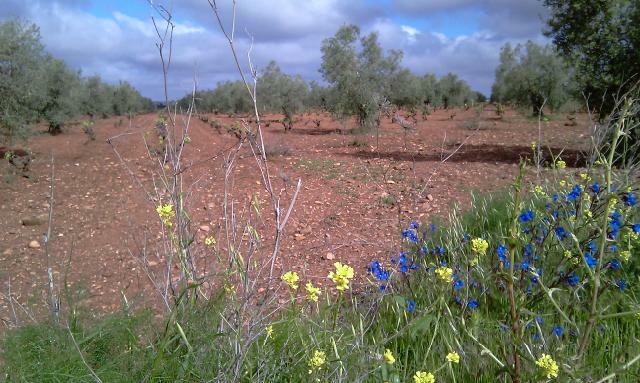 Our first taste of what the grit road protects us from occurs as the olives return and occasional patches of wheat relieve the ocean of vine, we stop at a cross roads a few steps off the road to frame a photo, our feet are coated in mud, our height increases and steps become leaden. This repeats again as we leave the true grit road and hop,jump,slither along the last km reaching tarmac like seals beaching from foaming seas. The albergue is by the church to the left of the route in, again, a restored old building with bits of roman looking staturary used in its initial construction. We think from a local map we are now at the edge of the See of Mud! In the Mud town. Alburge Carmen. The tumble dryer is paid for after the washing has been put out and taken in twice and the we can go out. We walk round in late afternoon, the church is closed, so are most shops but we fond a small grocerie open for bread and a couple of tomatoes to go with the cheese Tony has carried for two days, plus the inevitable bottle of wine. The only thing open of possible interest is the local museum, we don't expect much but it is raining. We are pleasantly surprised, apart from the collection of farm implements including one Tim believes may be for making chorizo and other sausage, a reasonable idea given the passion for pig products in the country, there is also a collection of old motor cycles and cars including some (though not the Model T Ford) that some of us have owned. Showing our age a bit here. Also the ptesentation is better than the last collection of bits and bobs we visited in the rain. Tomorrow the forecast is better it would be nice to believe it. 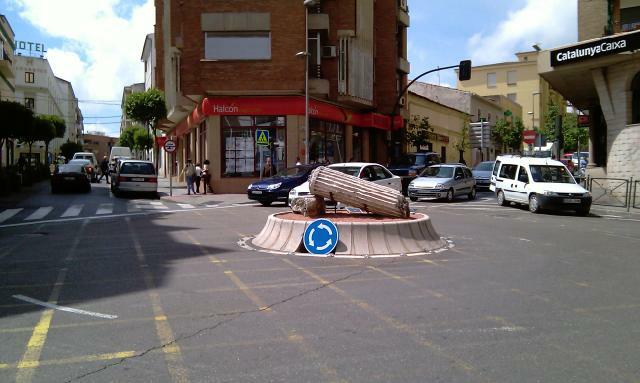 5.5 Saturday Zafra to Villafranca de los Barros. Once again the church in Zafra is a bird sanctuary for a flock of Lesser Kestrels that nest communally there. These unusual raptors nest comunally and this is the second protected site we have seen. We hoped that weather was improving but soon after an optimistic start the rain starts and continues all morning. Joe walks with us today, he is pleased with our time and speed as he considers himself unfit, so is pleased to finish with us. As Tony says its heads down keep walking weather, but Joe and Tim are behind setting the world to rights from opposite positions, the morning flies by! Noted by those in front a pair of hares one sitting on the track ahead, and a hoopoe and the call of the cuckoo. The countyside is fairly fertile with olive and vinyards thus the path is moderately muddy in keeping with the observed rule, mud and fertility are directly proportional. This rule reaches the status of a law when we arrive in Villafranca de los Barros and Betsy anounces that "barros" is spanish for "mud". This explains the lack of concern from the lady running the bar we enter for beers over the state of our boots! If you have a bar in "The Freetown of the Mud" you can't be too particular. Joe explains Villafranca probably meant that it started as a large house that provided a royal or ducal favour and was granted freedom from taxes. 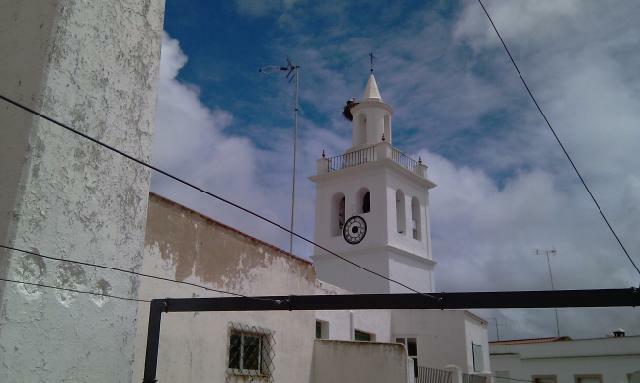 We lodge in the Alburgue Carmen a high roomed old house near the centre of town with a view of the inevitable stork nest from the balcony washing lines. In the afternoon the weather improves enough to use them, for a time. A Convent ional days walk. 4.5 Friday Fuente de Cantos to Zafra. An unpleasant 24hrs with two of us with a bout of Franco's Revenge. Both recovered enough to walk the distance today though (no taxigrinos here). Feet generally all round not causing complaints so walking even through mud and streams a pleasure. The weather continues wet in the mornings and dry and windy in the afternoons good for dryoing washing, though a close thing yesterday. We have slept beneath storks for last night and tonight, to Betsy's delight and in a convent to Tony's (alas no nuns remain unlike Carrillon de los Condes on the Camino Francais). The morning slipped by in an intermittant downpour, dodging puddles and crossing two streams on stepping stones just out of the water. When the sun did come out long views across fields and vinyards were very clear and marred only by the occasional pig production plant. The yellow arrows on this section quite adequate. We pass through Calzadilla de los Banos which seems almost deserted but we know some stayed in rooms there last night. We enter Zafra about 1.30 and meet Joe who has just checked into the albergue 200m down the street in the very nicely restored old convent. 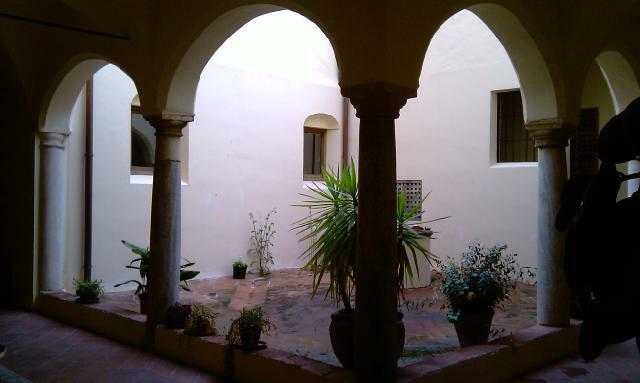 There has been a significant investment by secular authorities (as well as the enthusiastic Father Miguel) in providing cheap accomodation along the Via de la Plata, to encourage tourism, the 4 bed dormitory today has its own shower and the cloisters of the old convent are sensitively preserved.